I have a slight cookie obsession. Not just a little crush, but a lifetime love of basically any type of cookie. I pretty much blame my father. When I was little my mom would go to sell Tupperware at parties and my dad and I went to the bakery down the street. They had the best cookies and I was able to buy whatever I wanted. I am thankful that I also inherited my dads awesome genetics that have helped to keep me thin over the years even with questionable food choices. In college I started the bad habit of eating a giant cookie for lunch everyday. Notice I say as lunch not with lunch. Over the years my friends and family have learned that I bake when stressed. Not a batch of cookies, but literally dozens and dozens. My two boys have followed in my footsteps and can smell a cookie baking from a mile away. 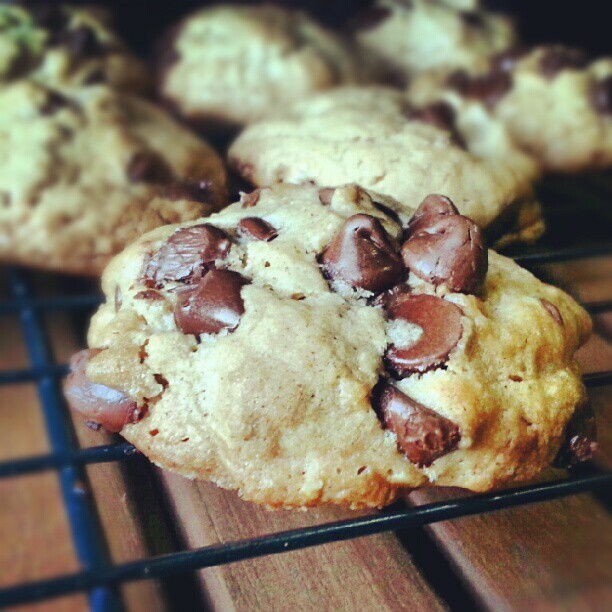 Last week I tried a new recipe for Chocolate Chip Oatmeal Cookies which was easy enough for my oldest to help me bake. This recipe has 11 ingredients. It takes a total time of 45 minutes and makes 15-20 cookies. I did make a few modifications to this recipe. I did not let the dough sit in the fridge as suggested by the recipe. My two boys were ready for cookies and not in the mood to wait an additional 30 minutes. I also did not find it necessary to add milk in order for the dough to come together. My cookies took 3-5 minutes longer to cook than the 9-11 minutes suggested. Longer cooking times are normal for my disco-era oven so your cooking times might be shorter. Finally, I made my cookies on the smaller side. My youngest does better with smaller cookies, big cookies turn into big messes. I followed the remainder of the recipe as written. I think these cookies lasted a total of a day in my house. My two boys ate two of these cookies a piece as soon as they came out of the oven. I liked that the cookies have oatmeal, but don't taste oat like. To me they taste more like a chocolate chip cookie with oats and a hint of cinnamon, which I really liked. If you aren't a cinnamon fan I would suggest cutting the total amount of cinnamon down to 1/2 teaspoon. 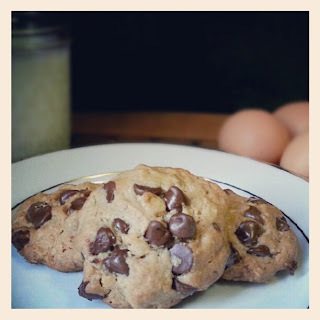 Overall, a great new cookie recipe. For the recipe go to Chocolate Chip Oatmeal Cookies.